The Associated Press reports that Diosdado Cabello, head of the Venezuelan National Assembly, said on Monday that María Corina Machado, the outspoken opposition lawmaker, has lost her seat in the country’s parliament -- and her immunity from prosecution for what government officials allege to be her role in fomenting violence -- after she criticized the government’s own response to opposition protests during an Organization of American States (OAS) summit last week. 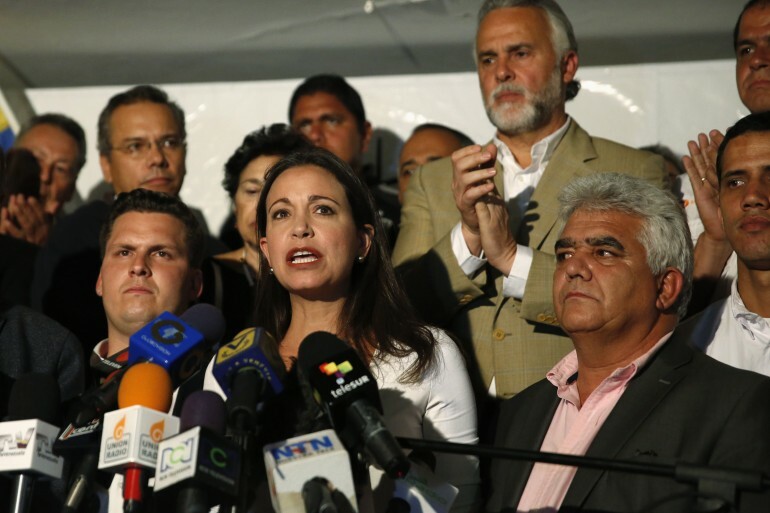 Cabello said that Corina Machado had forfeited the seat upon accepting Panama’s invitation to occupy their representative’s seat so that she could address the body. Upon her arrival in Lima, Peru, where she was set to participate in a International Freedom Foundation summit organized by writer Mario Vargas Llosa, Corina Machado wrote on Twitter, “Landing in Lima. Mr. Cabello: I AM a congresswoman as long the people of Venezuela want me to be." Panamanian ambassador Arturo Vallarino also commented on Cabello’s assertions, calling them “proof of injustice,” adding that “in no part of the world can an Assembly president strip a deputy who has been elected by popular will of her investiture."